“With [Microsoft’s] resources, I think they can sustain double-digit market share,” he said. via Morgan Stanley analyst predicts Microsoft will triple smartphone market share in 2 years. There you have it: users are so easily persuaded that a platform purchasing decision can be acquired via small outlays of cash for ads and subsidies for vendors and operators. How much did Google pay for distribution on the iPhone? I’m willing to bet that Google pays between $5 to $10 per iPhone for the privilege of default search. I think that’s where Schmidt got the figure for what Android is worth. It also makes sense given the rumor that surfaced that Google paid $100 million for the default search placement in the first round. Via Appleinsider: Google extends deal with Apple to remain default iPhone search. via Nokia’s New Chief Faces a Culture of Complacency – NYTimes.com. First compact smartphone, the 7650 in 2002. While these innovations and “firsts” happened many years ago, Nokia’s ability to innovate is just as important at the low end. Nokia was the first company to address the lowest tiers of the market with over a billion customers served. This was no small feat and many observers faulted the strategy when it began in the middle of the decade. I would not discount the difficulty and determination required in reaching those customers. Engineering a profitable low end product is as hard if not harder than engineering a high end superphone. More importantly, you have to find a way to distribute to these hard-to-reach customers and find ways to make the product useful, usable and affordable. Were it not for these efforts, the company would be facing collapse today, similar to the fate of Motorola or Ericsson: squeezed in the mid-range. Blaming “culture” is nothing more than suggesting bad management. The culture of Nokia did not change between the few years when it was successful and the years when it was not. The challenge Nokia faces is not complacency. It’s that the business model for selling voice-oriented phones is diametrically opposed to the business model for selling data-oriented phones. In one case you cooperate with and sustain operators, in the other you compete with and disrupt them. It looks damn near impossible to do both with the same organization. Everything must be done differently. The real problem is that Nokia has not realized this and therefore can’t build its own replacement. 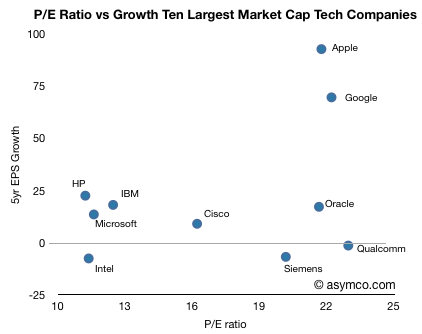 In the last article I described growth vs. P/E and price change for the largest “ultra-large cap” companies, of which Apple features prominent. 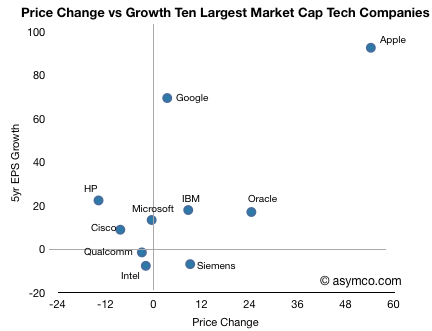 In this article I take the same analysis to the top ten largest technology companies (by market cap, see table at bottom). In this comparison, Apple no longer has the largest P/E ratio. Qualcomm, Google and Oracle are all at similar levels of valuation relative to earnings, however Apple’s growth outstrips them, only with Google in the same quadrant. Note the “Wintel” cohort consisting of Intel, Microsoft, HP clustered around the Low growth, low valuation quadrant in the lower left (coincidentally co-located with IBM). Oracle, Qualcomm and Siemens show high valuation with low long-term EPS growth. Cisco is somewhat on the fence. When comparing how the market has rewarded growth through share price appreciation, the correlation to growth is much better. Google seems under-rewarded.